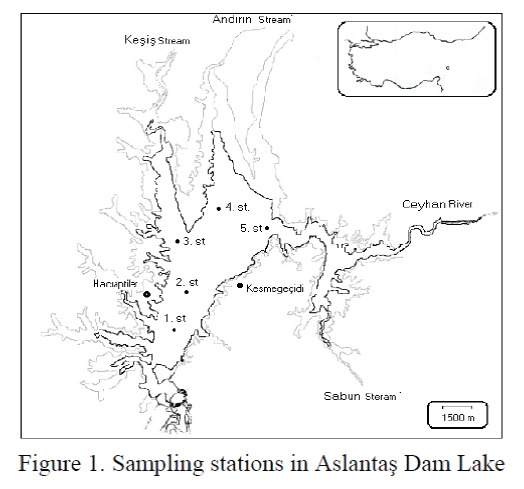 Quantitative and qualitative examinations of zooplankton in Aslantaş Dam Lake were studied between April 2001 and March 2002. It was established that total zooplankton in the reservoir is being represented with 18 species belonging to Cladocera and Copepoda. Number of the species belonging to cladocer and copepod are 14 and 4, respectively. Contrary to the number of species, abundance was found to be in favor of copepods (65.99% of total zooplankton). Remaining one third of total zooplankton (34.01%) was cladocerans. The most abundant species were determined as Bosmina longirostris among cladocerans and Thermocyclops vermifer persicus (Lindberg, 1936) among copepods. Monthly depth of light penetration zone (photic zone) was calculated using Secchi disk readings. It was observed that the copepods were more abundant than the cladocerans in the light penetration zone (photic zone). Beyond the light penetration zone the situation was reversed and the cladocerans were found to be more abundant than the copepods. Chlorophyll-a level was also examined in the lake. Since this study is the very first study carried out on the zooplankton of Aslantaş Dam Lake, all of the species observed are the first reports for Aslantaş Dam Lake. Zooplanktons occupy a very important place in water ecosystems including lakes. They are the first element of heterotrophic food chain where the energy produced by autotrophic organisms, phytoplankton, is converted to heterotrophic energy and made available for the organisms higher in the pyramid of food chain. They are the main source of the food for invertebrates, fish, and even, birds. Therefore zooplankton provides one of the most important nutrient sources in the energy conversion chain following the phytoplankton. Consequently zooplankton is also very important for fish production and fishing activities in aquatic environments. Aslantas Dam Lake is a reservoir which is one of the important freshwater resources in Southwestern Mediterranean region of Turkey. Fortyfive km away from the Mediterranean Sea the reservoir was built on the River Ceyhan in 1985 for the purpose of flood control, irrigation and energy production. It covers almost 6050 ha area and the largest width of the lake measures approximately 6 km while the longest length is 16 km. Maximum depth of the reservoir is 51 m. It is situated at an altitude of 146 m (DSI, 1966). Although Aslantas Dam Lake was built for irrigational purposes, fishing has eventually become an important commercial activity for the local people. Cyprinus carpio, Silurus glanis, Capoeta sp., Barbus sp., Leiciscus cephalus and Alburnus orontis are some of the commercial fish species caught in the lake (DSI, 2000). In order to carry out this research 5 sampling stations (Fig. 1) were established in the reservoir. Variations at the quantity and quality of zooplankton as well as physical and chemical parameters (water values) were observed for a year from March 2001 to April 2002. The samples were taken in monthly intervals except December. Observations were carried out by sampling the water at varios depths up to 50 m. The depths used for sampling were 0 m (surface), 1.0 m, 2.5 m, 5.0 m, 7.5 m, 10.0 m, 20.0 m, 30.0 m,40.0 m and 50.0 m. Samples were collected and stored in 1.7 liter Nansen bottles for the analysis of the level of chlorophyll-a and chlorophyll-a was analysed according to reference APHA (1995). Readings such as water temperature, dissolved oxygen (DO) (YSI 52 model oxygen meter) and pH were taken on the spot using a digital reading device (Orion 420 A model pH meter). Photic zone (the level of light penetration) was determined by observing visibility depth of Secchi disk sunk in the water. Then, observed depth was multiplied by 2.7 (Cole, 1983 and Moss, 1988). Zooplankton sampling was realized using two types of plankton nets with 60 μm mesh size in accordance with water sampling. The first one of the nets was a horizontal plankton net with a diameter of 30 cm and a length of 1 m. The second one was a standard trademark, Hidrobios, plankton net. The zooplankton collected in the nets was diluted in 5 lt distilled water and fixed in 4% formaldehyde prior to qualitative and quantitative investigations. Species identification was realized according to references Edmondson (1959), Dussart (1969), Kiefer and Fryer (1978) and Tsalolikhin (1995). Monthly observations of physical and chemical properties of water (Fig. 2.) have revealed various peaks for different parameters. Water temperature ranged from 11.04ºC to 30.92ºC at the surface and from 11.97ºC to 24.26ºC below the surface. Both surface and subsurface temperature reached to its maximum in August and to its minimum in January. Figure 2. Monthly variations at the properties of water. Other parameters have not shown similar peaks. For example, the level of dissolved oxygen (DO) has shown a deviation in a rather close range between 7.37 and 9.48 mg/L, and was at minimum in January. However, the maximum values of DO were obtained in February at the surface and in September below the surface. A slightly alkaline nature has been determined through pH readings. The maximum value of pH was 8.97 in November. It was almost neutral (7.68) in August. The level of chlorophyll-a was the only highly variable parameter. It has fluctuated between 9.81 mg/m³ and 47.37 mg/m³ below the surface and, at the surface, it has shown even greater variation between 7.26 mg/m³ and 121.79 mg/m³. This high variation might well be the indication of phytoplankton blooms at certain time of the year. The occurrence of greater variation at the surface can be attributed to the ability of phytoplankton to use the light to synthesize the organic matter. There were two peaks throughout the year, one in February (121.76 mg/m³) and one in June (110.51 mg/m³). Winter peak in February could be the result of the start of temperature increase in the water and summer peak (June) might be the result of decrease in the number of total zooplankton feeding on the phytoplankton. Examinations of depth dependent variations (Fig. 3) have shown that all of the parameters obtained their maximum values at first 10 m. Only chlorophyll-a has shown a fluctuating pattern. All the other parameters such as temperature, DO and pH, revealed a gradual decrease by increasing depth. DO was at its maximum (8.58 mg/L) at the surface and gradually decreased to the lowest value (6.01 mg/L) at 32 m. A similar decreasing pattern was also observed for water temperature. The temperature started around 22.40ºC at the surface and reached to its minimum value (12.10ºC) at 35 m. Although the deviation of pH was rather narrow, slight alkalinity (pH 8.07) at 5.0 m decreased to almost neutral water (pH 7.59) at 50.0 m.
Unlike the other parameters, the level of chlorophyll- a has not shown a pattern of gradual increase or decrease but a fluctuation. Nevertheless, it was still at its maximum at first 10 m. The maximum value (34.51 mg/m3) was reached at 7.5 m and a gradual decreased to a very low level (2.22 mg/m3) was followed until 32 m. There was a rather high increase from 32 m to 40 m and the level of chlorophyll-a became 15.73 mg/m3 . Consequently the level was declined to its lowest again at 50 m. High level of chlorophyll-a at first 10 m could be associated with the level of light penetration. The depth of photic zone (Fig. 4.) was determined through Secchi disk readings. The depth of photic zone in Aslantas dam lake did not exceed 10.35 m obtained in August. The minimum light penetration (6.08 m) resulted in May. Figure 4. Photic zone in Aslantas Dam lake. Qualitative analysis of zooplankton taken from the lake exposed the presence of 18 species, of which 4 belong to the superorder Copepoda and 14 belong to the order Cladocera of the classis Crustacea (Table 1). Fourteen cladoceran species were systematically grouped in 7 families consisting 12 genera according to Dodson and Frey (1991). Copepods (4 species) were classified (Williamson, 1991) and grouped in 2 families consisting 4 genus. Table 1. Systematics of Cladocera and Copepoda species encountered in Aslantas Dam Lake. Investigation of monthly zooplankton occurrence has revealed (a) their periodic preferences, i.e., year-around presence, seasonal presence and short-term presence, and (b) their habitat preferences such as surface dwelling, subsurface dwelling and both surface and subsurface dwelling (Table 2). Copepods, except Acanthodiaptomus denticornis, were found to be present both at the surface and below the surface. A. denticornis was the only copepod species which was seasonally present in the lake from September to January. Besides, this species inhabited subsurface, hence, A. denticornis was not presence at the surface. On the other hand Thermocyclops vermifer persicus was not present at the lake for three months from February to April. T.vermifer persicus, when present, showed no habitat preferences and observed both at surface and below the surface. Cyclops vicinus and Acanthocyclops robustus as well as naupli of copepods have shown a year around presence at all water columns investigated. Cladocerans such as Bosmina longirostris, Daphnia galeata, Diaphanosoma birgei and Leptodora kindti were commonly present in the water throughout the year whereas Leydigia leydigi was only encountered in May and August. Disparalona rostrata, Alona rectangula and Scapholeberis kingi inhabited mainly the surface water while Macrothrix laticornis was only found at surface. In contrast Ceriodaphnia pulchella and Daphnia sp. were mainly present below the surface. Total zooplankton collected year-around was 463717 ind/m3. Although 14 out of 18 zoplankton species belonged to the cladocera, the taxon contributed for only one third (34.01%) of the total quantity (Fig. 5). The contribution was 157712 ind/m3. Remaining 2/3 was composed of 4 species of the copepoda and their naupli (306005 ind/m3). An abundance ration of 1:2 seemed to be preserved at the samples from the surface and subsurface. It was observed that 22.42% of the zooplankton inhabited the surface. 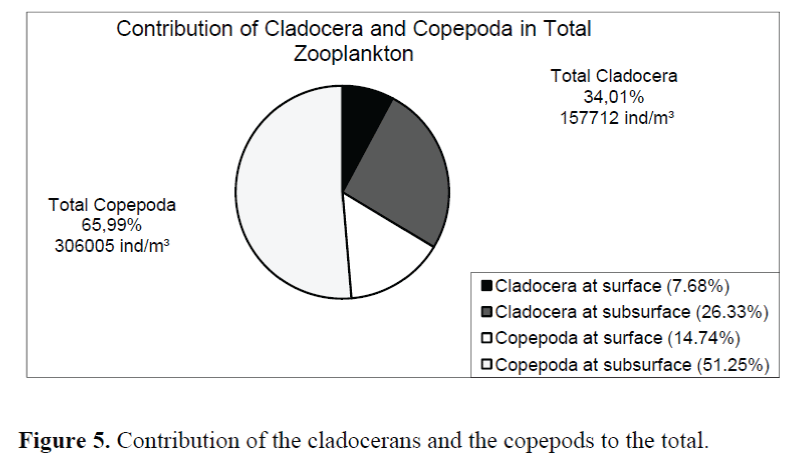 The number of copepods (14.74%) was almost twice as much as the number of cladocerans at the surface (7.68%). The zooplankton was mainly encountered below the surface. The amount collected below the surface was 76.58% of the total. However, the pattern of abundace ratio was the same (1:2). The abundace of cladocerans (26.33%) was almost the half of that of the copepods (51.25%) dwelling below the surface. Figure 5. 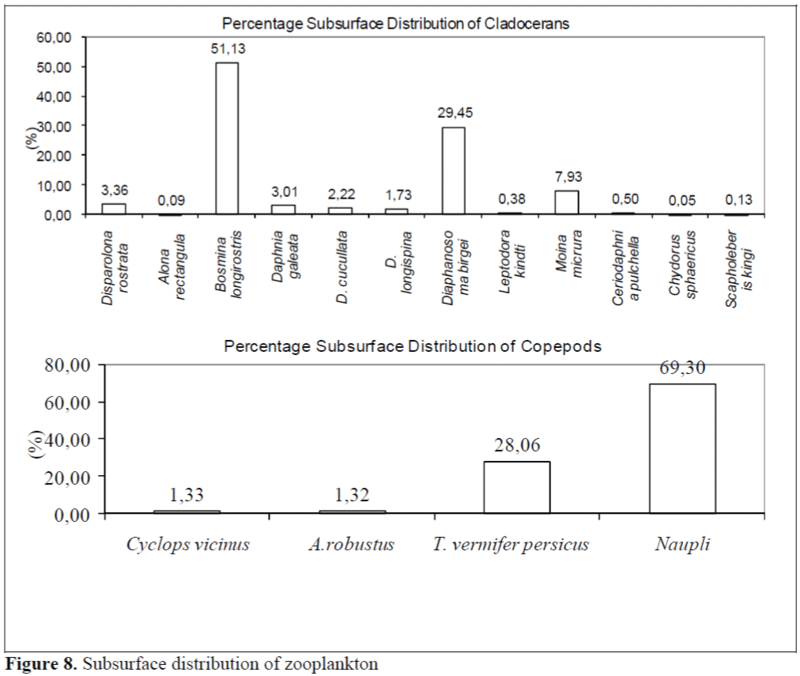 Contribution of the cladocerans and the copepods to the total. Curve obtained by the investigation of monthly zooplankton occurrence is mainly affected by the presence of the copepods (Fig. 6). The abundance of the copepods has shown an obvious tendency to increase starting from July. This sudden increase continued for three months and reached to a peak of 24.78% in September. Although the amount of copepods, hence total zooplankton, present in the water was still relatively high (24.12%) until October, a downward movement has already been started and continued until January where it was almost stabilized. The abundance of cladocerans, on the other hand, did not change highly throughout the year. However, Fig.6 indicates that the presence of the cladocerans was suppressed by the presence of copepods and the amount of cladocerans showed a tendency to increase while the number of copepods was decreasing. Phytoplankton is the primary source of food for zooplankton and the level of chlorophylla is closely related with the abundance of phytoplankton in the freshwater ecosystems. Our investigation has shown that there was an opposite relation between the abundance of zooplankton and the level of chlorophyll-a in Aslantas Dam Lake (Fig. 7). The level of chlorophyll-a has shown two peaks during the period of study carried out in the lake. First peak, phytoplankton bloom, was reached in June and followed with a sudden decrease to the lowest levels of chlorophyll- a. This sudden decrease and stabilization at the lowest levels corresponded to the period of increase in zooplankton quantity, which suggest a feeding suppression on the phytoplankton. Controversially, the level of chlorophyll-a reached the second peak following zooplankton depletion in the water in January. Chlorophyll-a was at a middle level during April and May, 2001 and in March 2002. Despite the presence of relatively less zooplankton at that time low chlorophyll-a level might be a seasonal stability caused by low light penetration in the water due to turbidity resulting from seasonal rainfall. Most of the zooplankton (76.58%) was collected below the surface in Aslantas Dam Lake. Average number of subsurface dwelling cladocerans was found to be 122093 individual per m3. The number for copepods was 237640 ind/m3. The most abundant cladoceran species was Bosmina longirostris accounting 51.13% of the cladocerans below the surface (Fig. 8). It was followed by Diaphanosoma birgei (29.45%) and Moina micrura (7.93%). The contribution of remaining 11 species to the number of cladocerans below the surface was only 17.49%. Copepod below the surface was mainly represented with the naupli (69.30%). Acanthodiaptomus denticornis was encountered for a few months and reflected a neglectible number. The most abundant species of Copepoda was Thermocyclops vermifer persicus and represented 28.06% of the copepods collected below the surface (Fig. 8). Examination of depth dependent abundance has shown that the number of cladocerans reached the highest level at 2.5 m and started to decline gradually as the depth of the water increased. The number of copepods was the highest at around 7.5 m. Because the number of copepods outnumbered that of the cladocerans’ general tendency of zooplankton distribution was determined by the copepods. Therefore the plot of total zooplankton resembled highly the plot obtained by copepod data. Similar pattern of increase at first 10 m and gradual decrease thereafter was also recognized for chlorophyll-a. Both the number of zooplankton and the level of chlorophyll-a reached lowest values at 30-35 meters. Following these values there was a small increase in the number of zooplankton before another decline. In contrary, increase in the level of chlorophyll-a was notably clear before the second decline. Pattern similarity between zooplankton and chlorophyll-a should be an indication of the relation between them. 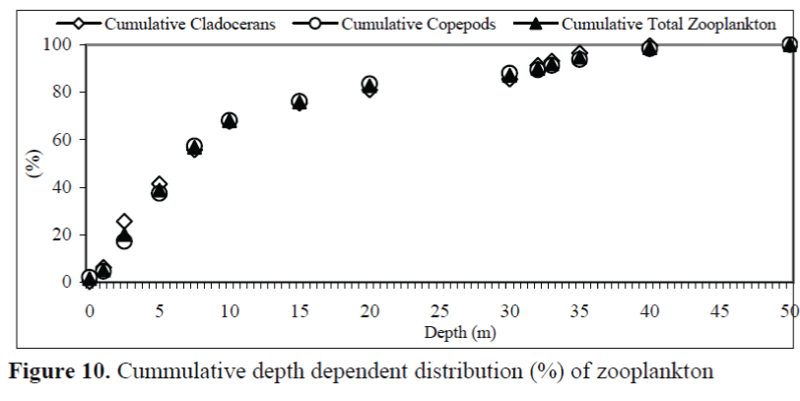 Cumulative depth dependent zooplankton distribution has shown that almost 70% of total zooplankton consisted of Cladocera and Copepoda was found to be occupying the first 10 m of the water column (Fig.10). This can be related with the extend of photic zone (Fig. 4) where the phytoplankton utilizes the energy from the light in order to catalyze organic matter production, which is consequently used by zooplankton for feeding. 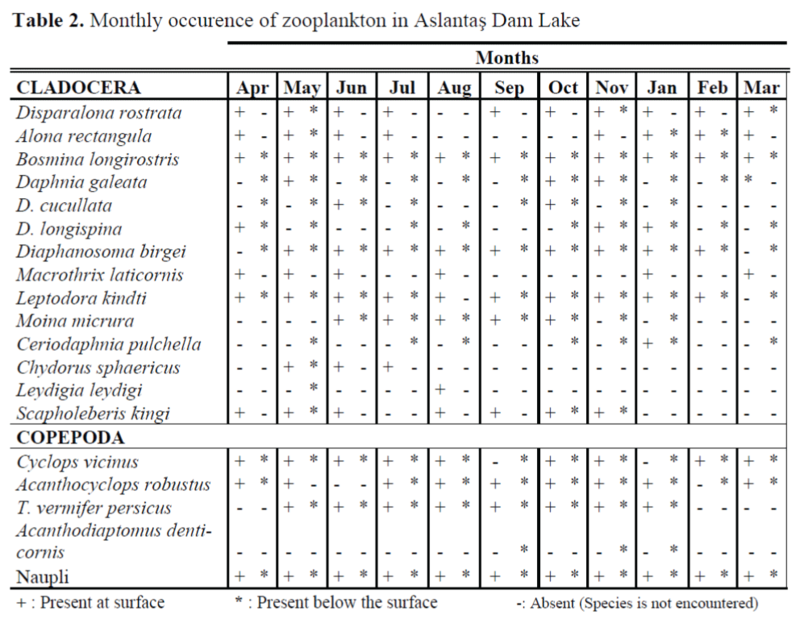 Zooplankton fauna of Aslantas Dam Lake is represented with 14 species of Cladocera and 4 species of Copepoda. Although the cladocerans were represented with more species than the copepods the rate of copepods (65.99%) were found to be more than the rate of cladocerans (34.01%) in the lake. A similar distribution pattern was observed in Kus Lake (Ustaoglu and Balik, 1990) and Seyhan Dam Lake (Bozkurt and Göksu,1997). Bosmina longirostris, Daphnia galeata, Diaphanosoma birgei, Leptodora kindti and Cyclops vicinus were encountered throughout the year in Aslantas Dam Lake. Year-around presence of these species were also reported in different water resources in Turkey. B. longirostris showed yeararound presence in the Lake Marmara (Ustaoglu, 1993) and Seyhan Dam Lake (Bozkurt and Göksu,1997). C. vicinus was observed yeararound in the Lake Marmara (Ustaoglu, 1993) as well as Kunduzlar and Çatören Dam Lake (Altindag and Özkurt, 1998). Although C. vicinus was found to be present throughout the year in Karagöl, B. longirostris was encountered most of the year (Ustaoglu, 1986). However, Ustaoglu and Akyürek (1994) reported short term (one month only) presence of B. longirostris in the Lake Aksehir. Edmonson (1959) claims that Moina spp. commonly occupies muddy and cloudy waters. Additionally, some members of the species are known to be present in the lakes with saline properties. Our observations indicate that clear but slightly alkaline waters, just as Aslantas Dam Lake, can also be suitable habitats for Moina spp. In contrast, Daphnia spp. favors the habitants of steady clear waters and vegetation areas of temperate lakes and reservoirs. Hence, the occurrence of Daphnia in the study area is an expected observation in spite of the lack of vegetation in Aslantas Dam Lake. Species such as Moina micrura, Bosmina longirostris, Ceriodaphnia sp. and Diaphanosoma sp. are reported to be widespread (Mathev, 1979) in the water ecosystems. Therefore the presence of these species in Aslantas Dam Lake suggests a relation with their ecological preferences. Researches on the vertical distribution of zooplankton indicates that only a few species of copepods and cladocerans move to the surface and stay there during the day- time (Wetzel, 1983 and Horn and Goldman, 1994). General tendency is to move towards the surface during the night and to commence backward vertical movement while the sun is rising. Our findings are in accordance with this type of taxis. The highest number of cladocerans were collected from 2.5 m. Copepods were found to be very few at the surface and close proximities while they were highly abundant at 5.0 m and 7.5 m.
The amount of crustacean zooplankton is reported to be relatively low up to 4 m. Although Daphnia longispina shows a distribution up to 50 m, this species is densely observed around 13 m. D. cucullata is abundant up to 10 m and its abundance reduces gradually at the depths below 10 m. Bosmina longirostris lives close to surface although the density is high at around 15 m. In contrast, Leptodora kindti inhabits close proximities to the surface (Welch, 1935; Pennak, 1978; Ustaoglu, 1982; Horppila, 1997 and Ventrale et al., 1997). Similar results were obtained from the research undertaken in Aslantas Dam Lake. There was no encounter of Daphnids up to 2.5 m. However, Daphnia longispina, D. cucullata, D. galeata and Leptodora kindti were abundant at 10. m, 7.5. m, 15. m and 5. m, respectively. We found that only Bosmina longirostris was present from surface to 40 m and revealed the highest number of individual at 2.5 m. Occurrence behavior of the copepods was also in line with the references. They were very low in number near the surface and obtained their maximum around 5 m.
Kolisko (1974) reports that zooplankton is found abundant at the photic zone where the food is plentiful. It is also claimed that the naupli lives more close to surface than the mature individuals. The cladocerans, like-wise, are abundantly present in photic zone due to the availability of the food. The accumulation of 57.38 % of the copepods and 55.78 % of the cladocerans in photic zone confirm these results. It is obvious that there is a close relation between the amount of zooplankton and phytoplankton as far as food demand and supply are concerned. The amount of the phytoplankton increases when there is no or little feeding pressure forced by zooplankton. On the other hand availability of plentiful food triggers the growth of zooplankton. Consequently, increase in the number of zooplankton suppresses the growth of phytoplankton (Kolisko, 1974; Cirik and Cirik, 1991; Wu and Culver, 1991; Horn and Goldman, 1994 and Noges, 1997). The results of the chlorophyll-a analyses confirm this relation in Aslantas Dam Lake. We have observed that there was an obvious increase in the level of chlorophyll-a in June, when the number of zooplankton started to increase. As the number of zooplankton increasing the level of chlorophyll- a was declining in the lake. Following the lowest level of zooplankton in January, the number of phytoplankton, deducted from chlorophylla, climbed to the highest level in February. I would like to thank Dr. Süphan Karaytug (Mersin University, Mersin, Turkey) for confirming the identification of the copepod specimens. Altindag, A., Özkurt, S., (1998). A Study on the zooplantonic fauna of the Dam Lakes Kunduzlar and Çatören (Kirka-Eskisehir), Turkish journal of Zoology, 22: 323–331. APHA. (1995). Standard Methods for the examination of water and waste water 19th ed. American Public Health Association, Washington DC. Bozkurt, A., Göksu, M.Z.L., (1997). Seyhan Baraj Gölü (Adana) Copepoda ve Cladocera (Crustacea) faunasi. Biyologlar Dernegi, III. Ulusal Ekoloi ve Çevre Kongresi, 3-5 Eylül, Kirsehir. Cirik, S., Cirik, S., (1991). Limnoloji (Ders Kitabi). Ege Üniversitesi Su Ürünleri Yüksekokulu Yayinlari No; 21, 166. Cole,G.A., (1983). Textbook of Limnology. Third edition, the C.V. Mosby Company, 401. Dodson, S.I., Frey, D.G., (1991). Cladoceran and other Branchiopoda. 723-786 in Thorp, J.H., and A.P. Covich (eds.). Ecology and classification of North American freshwater invertebrates. Academic Press, San Diego. Dussart, B., (1969). Les Copepodes des Eaux Continentales d’Europe Occidentale Tale II. Cyclopoides et Biologie N Boubee et Cie. Paris, 221. Edmondson, W.T., (1959). Methods and Equiment in Freshwater biology 2nd ed. John Willey and Sons. Inc., NewYork, 1194-1202. Kiefer, F., Fryer, G., (1978). Das Zooplankton der Binnengewasser 2 Teil. E Schweizerbart Verlagsbuchhandlung, Stuttgart, 380. Moss, B., (1988). Ecology of Freshwaters: Man and Medium. Second Edition, Blackwell Scient. Publ., 417. Mathev, P.M., (1979). Studies on the Zooplankton of a Tropical Lake. Central Inland Fisheries Fauna, India. Noges, T., (1997). Zooplankton-Phytoplankton Interactions in Lakes Vortsjarv, Peipsi (Estonia) and Yaskhan (Turkmenia). Hydrobiologia, 342/343: 175-184. Horppila, J., (1997). Diurnal Changes in the Vertical Distribution of Cladocerans in a Biomanipulated Lake, Hydrobiologia, 345: 215- 220. Horne, A.J., Goldman, C.R., (1994). Limnology. McGrow –Hill press United States of America. 133. Pennak, R.W., (1978). Freshwater Invertebrates, 2nd Ed. John Wiley and Sons. New York, 803. Tsalolikhin, S.J., (1995). Key to freshwater invertebrates of Russia and adjacent lands. St Petersburg, 627. Ustaoglu, M. R., Akyürek, M., (1994). Aksehir Gölü zooplanktonu, XII. Ulusal Biyoloji Kongresi, 5 - 7 Ekim. Ustaoglu, M.R., Balik, S., (1990). Zooplankton of Lake Kus (Bandirma) (in Turkish) X. National Biology Congress, 11-19. Ustaoglu, M.R., (1993). Zooplankton (Metazoa) of Lake Marmara (Turkey), Biologia Gallohellenica, 20: 259-266. Ustaoglu, M.R., (1986). Zooplankton of The Karagöl (Yamanlar-Izmir-Turkey), Biologia Gallo-Hellenica 12: 273–281. Ustaoglu, M.R., (1982). Vertical migration of crustacean plankton in Piburger See (Tyrol, Austria), Jahresbericht der Abteilung Limnologie, Institut für Zoologie, Universität Innsbruck, 8: 70-82. Ventrale, A.M., Saorikari, V., Vuorio, K., (1997). Vertical and seasonal distribution of microorganisms, zooplankton and phytoplankton in a eutrophic lake, laboratory of ecology and animal systematic, Hydrobiologia, 363: 229- 240. Welch, P.S., (1935). Limnology. McGraw-Hill Book Co., New York: 522. Wetzel, R.G., (1983). Limnology. Michigan State University, 767. Williamson, C.E., (1991). Copepoda. In: Ecology and classification of North American Freshwater Invertebrates (Eds J.H. Thorp & A.P. Covich), 787–821. Academic Press, San Diego, CA, USA. Wu, L., Culver, D.A., (1991). Zooplankton grazing and phytoplankton abundance, Journal of Great Lakes Research, 17: 425-436.